I hope you are all having a wonderful Monday. Today I have a newer indie to share with you. I stumbled across Chloe & Bella a few weeks ago and really liked what I saw. Barbara, the owner of Chloe & Bella allowed me to pick out what shades I wanted to review. Midnight is a blue black shimmer with silver glitter. The formula was not too thick or too thin, and only required two coats for full coverage. 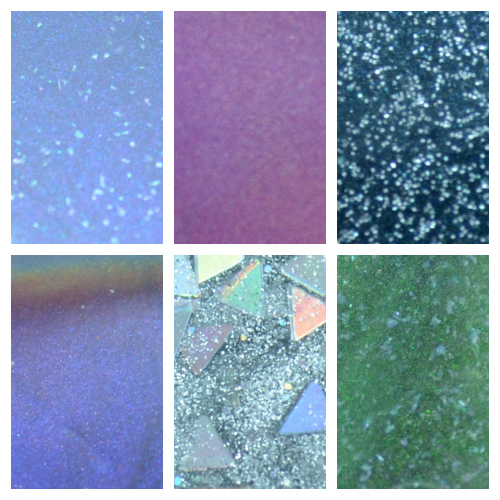 Starlight is a chrome glitter polish with iridescent triangle glitter. The formula of this provided great coverage with two to three coats. I layered it over Midnight so that you could see how well it covered the nail. There are two coats on all fingers with a third coat over the ring finger. I was unable to get any triangle glitter out of the bottle, but I love this color regardless. Stormy is a grey polish with blue shimmer and grey flakies. Pictured above is four coats with no base color. I found the formula to be easy to work with, but I would have liked if this would have been a little more pigmented. The flakies were a really nice addition to this color. They are subtle, but add something special. Chloe & Bella have a variety of different shades available all for a very reasonable price. Each bottle is 10mL and retails between $5.95- $6.95 per bottle. I really like Midnight! That's a gorgeous color. Especially for some winter nail art! Nice swatches! These colors feel very fall to me too. These are soooooooooo pretty! Thank you!